Jihadists on social media reported earlier today that Abu Firas al Suri, who served al Qaeda since the 1980s, was killed in an airstrike in Syria. Abu Firas relocated from Yemen to Syria in late 2012 or early 2013 as part of al Qaeda’s attempt to smooth over the then simmering tensions between Al Nusrah Front and the Islamic State of Iraq and Sham (ISIS). The mediation efforts failed and ISIS grew into the Islamic State, becoming al Qaeda’s chief jihadist rival around the globe. It is not clear which nation launched the airstrike that purportedly killed Abu Firas. His putative death has not been confirmed by any official sources. Several well-connected jihadists on Twitter announced his death, saying the US hunted him down in Kafr Jalis, which is in the northwestern province of Idlib. One of the tweets can be seen on the right. 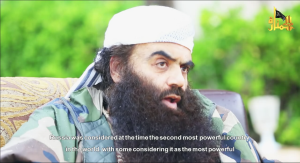 Abu Firas made his first public appearance in March 2014, when he was featured in an Al Nusrah Front video. The al Qaeda leader testified against Abu Bakr al Baghdadi’s organization, blaming it for the jihadists’ infighting in Syria. Abu Firas also said he had warned another al Qaeda veteran, Abu Khalid al Suri, about ISIS’ intent to kill him. Abu Firas’ warning didn’t save Abu Khalid, as he was killed in a suicide attack the following day (Feb. 23, 2014). After the news broke of Abu Firas’ death, jihadists posted the picture on the right showing him sitting with Abu Khalid (far left) and Hassan Abboud (center). Abboud, the first emir of Ahrar al Sham, was killed in an explosion in September 2014. 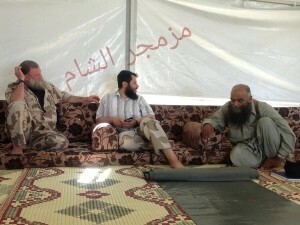 Abu Khalid acted as Abboud’s mentor and played a leading role in Ahrar al Sham. The Long War Journal helped reveal Abu Khalid’s senior role in Ahrar al Sham in December 2013. Up until that time, his leadership position had not been formally acknowledged by Ahrar al Sham. Nor was it reported by Ahrar al Sham’s allies in the West. If today’s report is in fact true, and Abu Firas perished in an airstrike, then all three of the men pictured above sitting together are now dead. Abu Firas was a “core” al Qaeda member, under any reasonable definition of the term. According to a biography provided by Al Nusrah, Abu Firas traveled in the early 1980s to Afghanistan, where he met with Abdullah Azzam and Osama bin Laden. He trained both Afghans and Arabs, as well as jihadists from other countries around the world. Further demonstrating Abu Firas’ seniority within al Qaeda, the Al Nusrah Front said that he worked with the group’s first two military commanders, Abu Ubaidah al Banshiri and Abu Hafs al Masri. Abu Firas also worked with Abu Musab al Zarqawi, the deceased commander of al Qaeda in Iraq. In 2003, he relocated to Yemen and stayed there until late 2012 or 2013, when the conflict between ISIS and Al Nusrah Front erupted. Al Qaeda’s senior leadership then dispatched Abu Firas to Syria in an attempt to help put an end to the dispute. 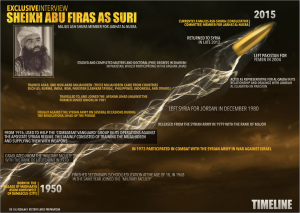 Al Risalah, a pro-al Qaeda and pro-Al Nusrah magazine, published an infographic with Abu Firas’ biography on it in October 2015. The biography emphasized his longstanding opposition to the Assad family, noting that he used the expertise he gained in the Syrian military to help the “Combatant Vanguard” (or “Fighting Vanguard”) fight the Syrian regime in 1976. 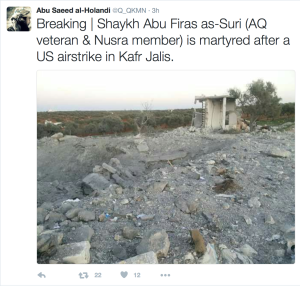 In more recent years, Abu Firas served as Al Nusrah’s spokesman and as a member of the al Qaeda branch’s elite Shura council. He was known to stir controversy. For example, in more recent months, he became a critique of Ahrar al Sham’s strategy for waging jihad. Abu Firas was a proponent of the idea that some Muslim-majority countries should be turned into “erupting jihadi center[s].” He explained in a video released in June 2015 that the “concept of jihad in the Levant was absent from people’s minds” for decades. “Nobody even heard of the word jihad,” Abu Firas continued. “In reality, the Levant is regarded [as] one of the most important centers in the Islamic world due to its close proximity to Palestine, to the Hijaz [Saudi Arabia] and being in the center of the Islamic world.” He drew on Marxist thinking to explain that the jihadists needed to spark revolutions that could change the course of the Islamic world for generations to come. IN THIS WAR THE DRONE IS THE WEAPON TO THIS WAR ON TERRORISM. IN SYRIA AND WORLD WIDE OFFENSIVE AGAINST RADICAL ISLAMIST.